Looking to add a specialized water garden paradise to your swimming pool landscape? Here at Everything Waterfalls, we showcase a strategic line of Universal Rocks in our outdoor showroom. One key advantage of incorporating artificial rocks for our home's landscape is that it allows us to be very creative in designing a waterfall garden of choice. Our stunning Oasis swimming pool waterfalls kit with edge rocks completes a three piece 11 1/2' pool rock designed just for the swimming pool landscape. This beautiful pool waterfalls is the medium size waterfall rock of very popular line of our cave like waterfall designs. This beautiful swimming pool waterfalls called the Oasis has a main waterfalls rock that's about 32" high and 67" long. 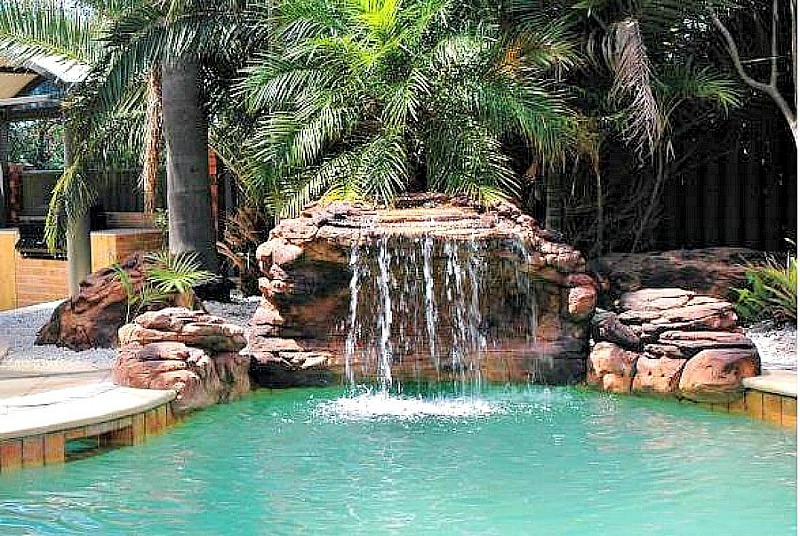 The specially designed edge rocks gives this gorgeous pool waterfalls a complete rock formation for a tropical water garden paradise for your swimming pool landscape. This spectacular backyard pool landscape feature and pool waterfalls kit comes with a 1.5 inch (40mm) water outlet fitting that can easily be hooked up to your existing pool pump. These decorative waterfall pool rocks are made from a light weight combination of polymers for excellent properties and characteristics for the ultimate waterfall design. Polyurea, being the super polymer of plastics has excellent properties for temperature while being stronger than cement and other waterfall materials. The top coating of our swimming pool waterfalls is a formulation of natural oxides like sand and rock giving these spectacular waterfalls the complete natural and realistic look. Additional waterfall rock coloration and makeup is further explained in our rock waterfall matrix. 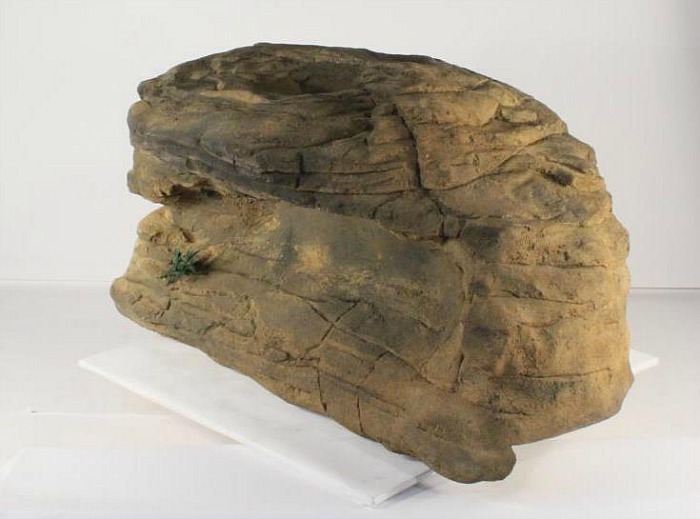 All of our cool Universal Rock designs are brilliantly casted from real rock formations where weathering and erosion sculpting through thousands of years are now being brought to your yard's landscape for incredible beauty and enjoyment. Also, our pool water features are designed for both chlorinated and salt water pools. Our breathtaking pool waterfall kits are an excellent addition to your outdoor or indoor pool decor, and will surely be the main focal point of all your backyard get-togethers and pool parties. All pool waterfalls and edge rocks come with 4" edge. This edge gives your pool waterfalls a finish look over the pool coping and gives the waterfall formation the look of going towards the water. 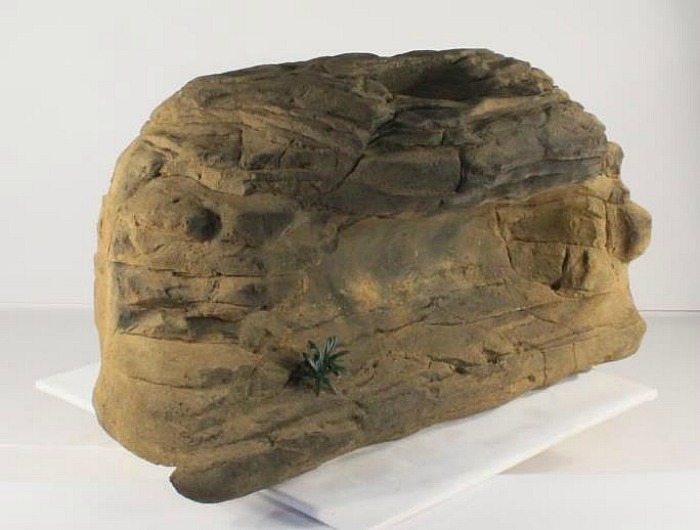 Overall rock height does include the rock edge. L 67" x W 43" x H 32"
L 35" x W 24" x H 12"
L 35" x W 23" x H 12"